Ring Ring…the phone went. “Hello Ayo, been expecting your call”, the person on the other side said. He is Akintunde Ige, a Nigerian footballer who has seen his once-promising career halted due to a persistent knee injury he sustained a few weeks before the 2013 U-17 FIFA World Cup in Abu Dhabi. Akintunde was a media sensation in a Nigeria having impressed in the trials for Nigeria’s U-17 Golden Eaglets team ahead of the 2013 World Cup. He was almost a sure bet to be selected for the national team until he suffered a knee injury in the Calabar training camp in June of that year. As with the case with many lost talents, the player was dumped by the national team who did not have the personnel or funds to take care of him or nurse his injury. The now 21-year-old footballer was initially part of the 40-something players picked for a Dubai training camp and coaches had assured him of his place in the squad but his injury was now an issue. Akintunde was best friends with goalkeeper Dele Alampasu but they have drifted as the goalie became a Nigeria Super Eagles squad option. He told me: “A few days before we were to leave Calabar for Dubai, I got a knee injury and that ruled me out of contention with the team. “Dele Alampasu was my closest friend but we have drifted apart, now he is a professional, I am not. Dele Alampasu who is now a Nigeria Super Eagles star has made his name in Portugal with FC Porto and current club C.D. Feirense. He would also tell me about another Nigerian footballer who was part of the World Cup winning squad Isaac Success who also got injured but was lucky it happen a few days to the tournament proper. I asked him what he thought of Kelechi Iheanacho – the star of that team in 2013 – and he said: “Kelechi Iheanacho was very average in training. He was good but Isaac Success was ahead of him”. After leaving camp following his, the player started playing in the amateur leagues in Nigeria in the hopes of making a breakthrough as a young player with a bad knee. 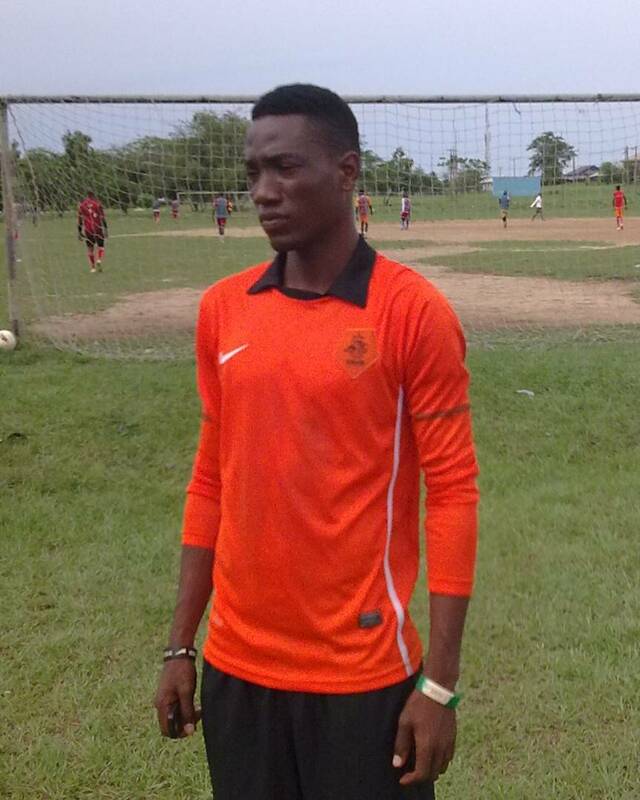 He rejoined Temple Soccer Academy, the same institution that helped him secure a place with the Eaglets in the first place. The footballer has also played for Dona FC of Lagos and MFM FC (currently in the top division) when they were still with amateur one. In the intervening months, the player has linked up with popular agent Ahmed Mohammed who has helped him secure a trail with a German team. His career has suffered many setbacks, mainly because of his knee. Despite this, Akintunde has not led his dream of becoming a professional footballer fade as he strives to make the big break in Europe. His current club is AM FC who play in the amateur leagues in Nigeria. He is currently being managed by Hammed Mohammed, a former Nigerian international. The footballer says he is back to full fitness and the only thing stopping him from leaving Nigeria for trails in Europe in money. He has been beset with difficulties selling his late father’s Toyota Sequoia jeep as the prizes put forward by potential buyers still too small to sponsor his exit. He said: “In an ideal world, I should have been playing professionally and making money if I was treated by the Nigeria Football Federation after my knee injury in 2013 just before the U-17 World Cup but I was dumped.